Nerf guns are generally designed to be safe for children, thanks to their foam darts that have an extremely limited range and little kick. Even if someone were to unload a 50-dart belt Nerf machine gun at you, it would feel like you were being pelted by some annoying marshmallows. Obviously when you get older you need bigger toys and more firepower. Which is probably what Make Labs engineering intern Dan Spangler had in mind when he made a propane-powered dart cannon. The gun is based on the Better Nerf Gun, designed by Simon Jansen, which could already achieve some serious accuracy at hitting a target up to 33 feet away. Spangler’s propane cannon has some tweaks, including a wider PVC chamber for filling with gas as well as a flint igniter from a lantern installed into the back of the pipe. To fire the gun, Spangler loads the dart into the detachable barrel, fills the chamber with fuel from a BernzOmatic mini torch, and turns the flint to fire. Although the video does not look too impressive, apparently the Nerf dart had enough force to leave a noticeable dent on a whiteboard. It will probably be more interesting to see the range of the propane Nerf cannon once it is fired outside of the Make Labs. 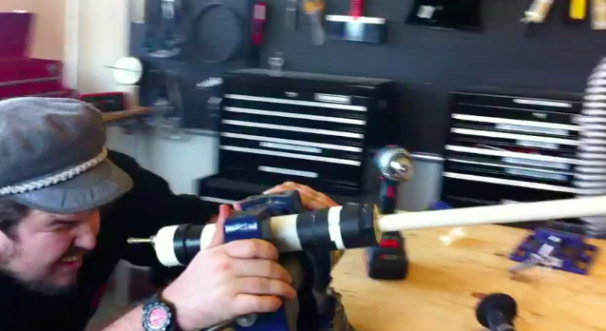 Be sure to check out the full build of the Propane Nerf Dart Cannon on Make--just don’t let your kids anywhere near it.